Some files can contain viruses or otherwise be harmful to your computer. It is important to be certain that this file is from a trustworthy source. Do you want to open this file? 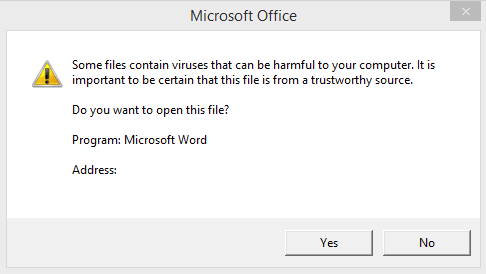 The warning message is a security feature of Microsoft Office to protect against malicious attack. This is because editing the file in the cloud with a local application requires Office program to download a temporary file to local device before you’re able to view and edit it. To resolve the issue where the warning message appears every time you try to open a file stored in SharePoint or OneDrive, try one of the following methods. Go to Network and Internet -> Internet Options. 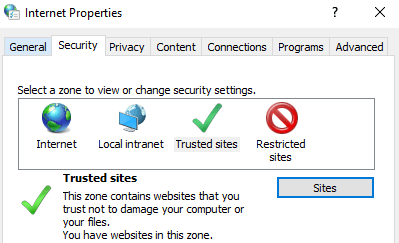 In the “Internet Properties” dialog, go to Security tab. Click or tap on Sites button that appears. 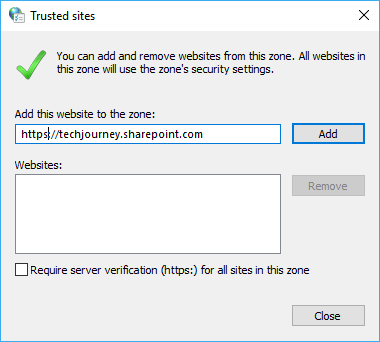 You should add the source site URL to the Trusted Sites list even if you don’t use Internet Explorer (IE) web browser, Trusted Sites List is a system-wide setting, not an IE setting. Open the Office file again and the warning prompt should be gone. Installing OneDrive or OneDrive for Business client to sync the files between local PC and the files on the cloud in OneDrive or SharePoint. With OneDrive client, all files can be accessed in File Explorer or Windows Explorer in a local folder. After syncing the files, create, save and edit the local files with Office applications, which then will be synced automatically to the cloud by the client. As the files are now local (not downloaded from Internet), no warning will be prompted.